Make a tasty marinade for veggie and pork kabobs with coarse ground mustard and Italian dressing. 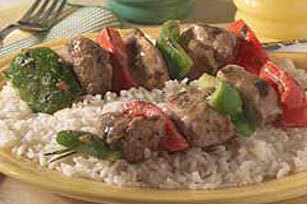 You'll love these Marinated GREY POUPON Pork Kabobs! Preheat grill to medium heat. Pierce meat several times with fork; place in resealable plastic bag. Mix dressing and mustard; pour over meat. Seal bag; turn over several times to evenly coat meat with dressing mixture. Refrigerate 15 min. to marinate. Drain; discard bag and marinade. Thread meat onto six skewers alternately with the peppers. Grill 8 to 10 min. on each side or until meat is cooked through. Serve with the rice. Meat can be marinated in dressing mixture overnight. Substitute green peppers for the red peppers.